Bloedel is for the Birds! There are new feathered friends at Bloedel! The Conservatory is alive with new melodious songs and exotic sights! Many of our new feathered friends are waxbill finches, named for their bright red cone shaped bills that are similar to the colour of sealing wax. Timbrado and Roller canaries are also stretching their wings and their lovely vocals are enhancing the ambiance of the dome. And let’s not forget Sylvester! The handsome new Silver Pheasant! 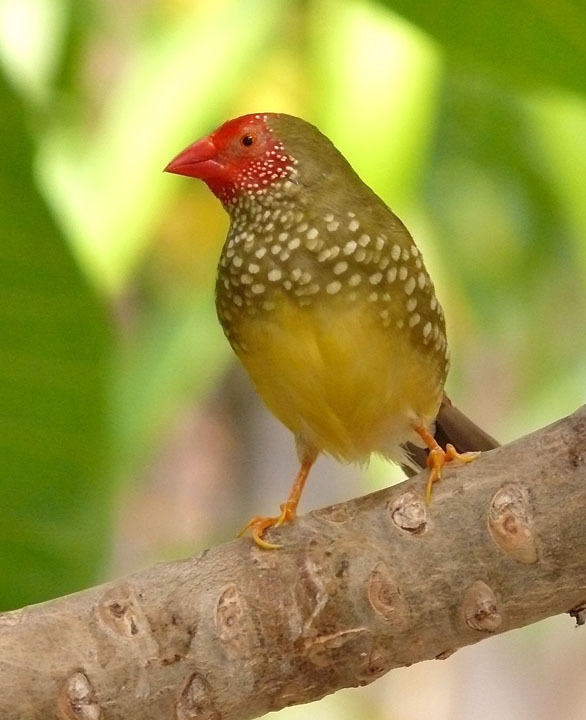 The Star Finch is native to Australia where it can be found in grasslands and dry savannas. The males are olive in colour with a large red face mask and star-like spots over his chest and neck (click here for video). Females have less colour on the face and no red on the chin. These birds are native to Africa, preferring to live in the grasslands, marshes and open areas with thorn scrub. Both males and females are easily identified by their crimson eye mask. This small bird, also native to Africa, relies on grasses for food, shelter and nest building in the wild. They are also insectivorous, eating gnats, aphids, fruit flies and termites. The males have a very melodious song and is the easiest way to tell males from females. These small waxbills are also native to Africa. Unlike some species, both males and females will sing. The females are a slightly duller blue than the males. 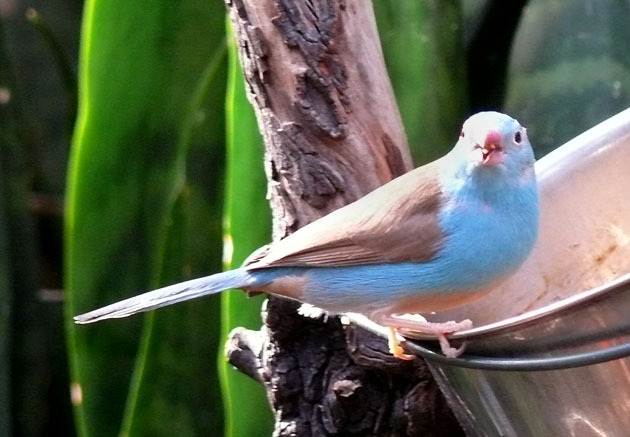 Here is a video of the little Cordon Blue Finch having breakfast. 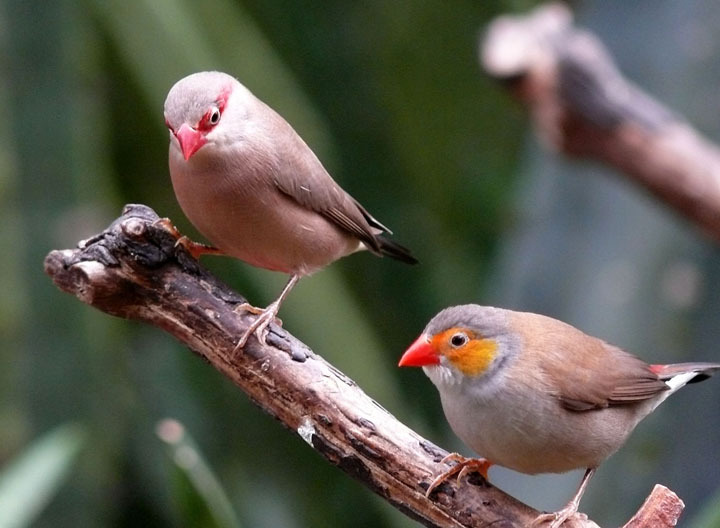 Also known as the Ribbon or Bearded finch, both sexes are light gray and tan with speckles, but the male is easily recognized by the swash of red under his chin. 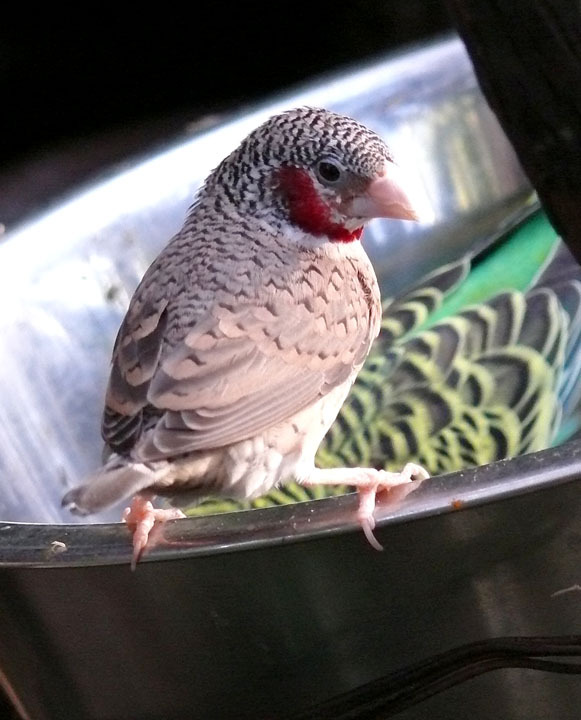 These finches are native to Africa, living on the Savannah, bush and farmland. Favorite foods are live food (mealy worms), millet and fruit. 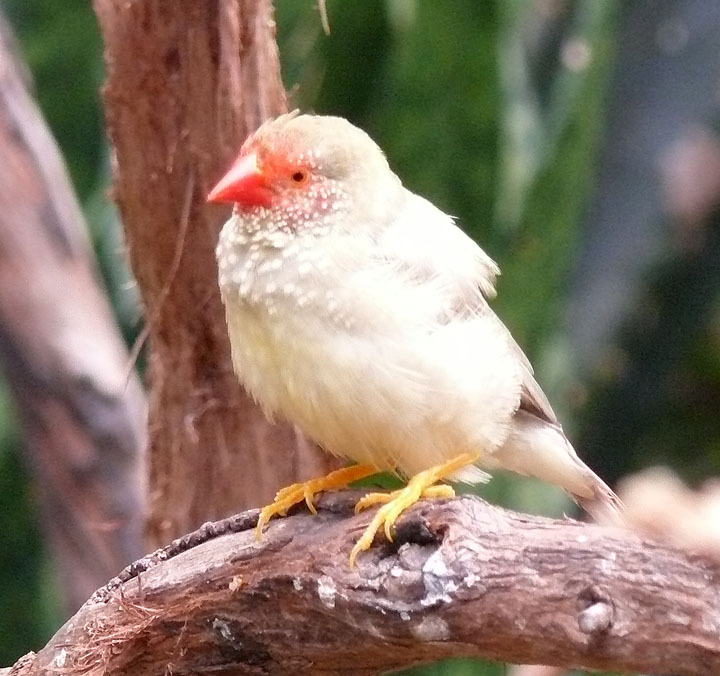 This finch is native to central Africa and is slightly smaller than a canary. Females have a ring of black dots around their necks. It is said the Green Singing Finch has a lighter, more delicate and higher pitched song than canaries and sing frequently throughout the day. 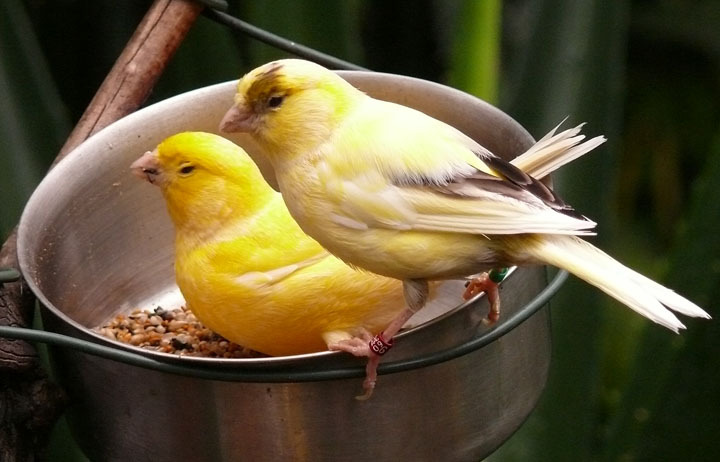 The Conservatory is now also home to a variety of new canaries thanks to the Greyhaven Exotic Bird Sanctuary. 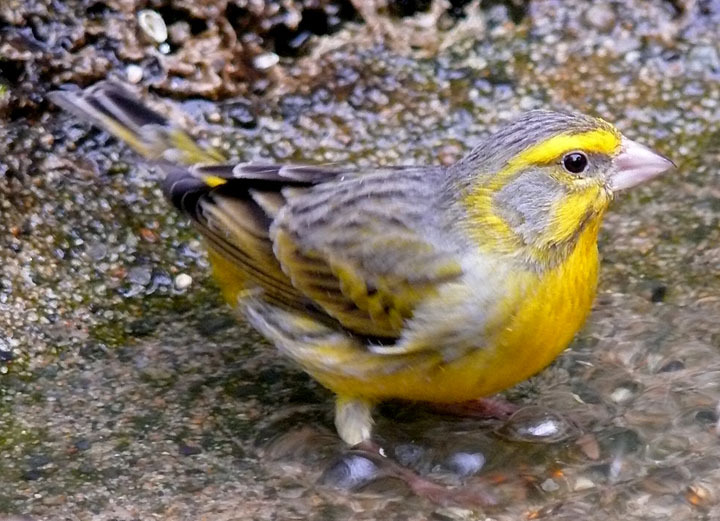 Canaries are native to the Canary Islands off the coast of Africa. You will be able to see both Roller Canaries (both all yellow and a mixture of yellows, cream and brown) and Timbrado Canaries. While both have lovely songs, the Timbrado has a greater range of notes. 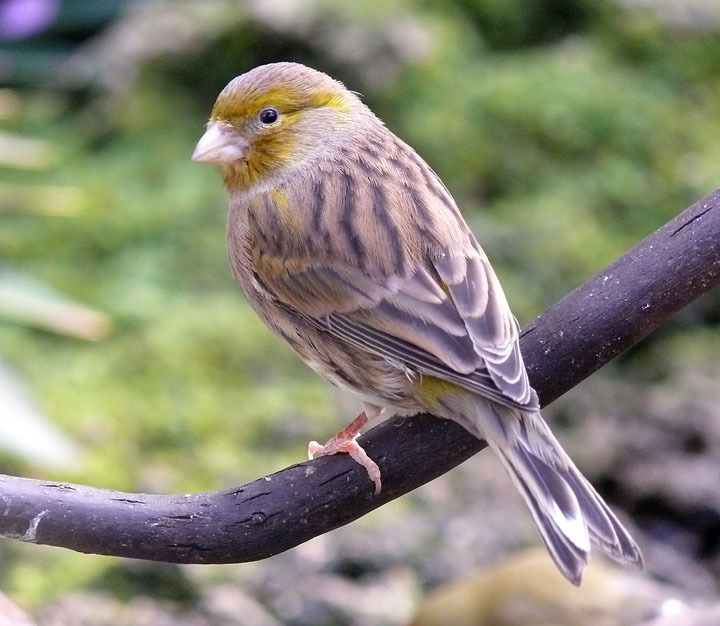 Originally imported to Spain from the Canary Islands during the 1400s, the Spanish Timbrado Canary began to be bred in Spain in the 1940s and 50s. Only the male canaries of both species sing, which is the only way to tell them apart from females. And let’s not forget Sylvester! There are 15 subspecies of Silver Pheasants, with the True Silver Pheasant being the largest of them all. The striking white feathers of the male are laced with delicate black patterns (see video). The legs and face wattles are red. 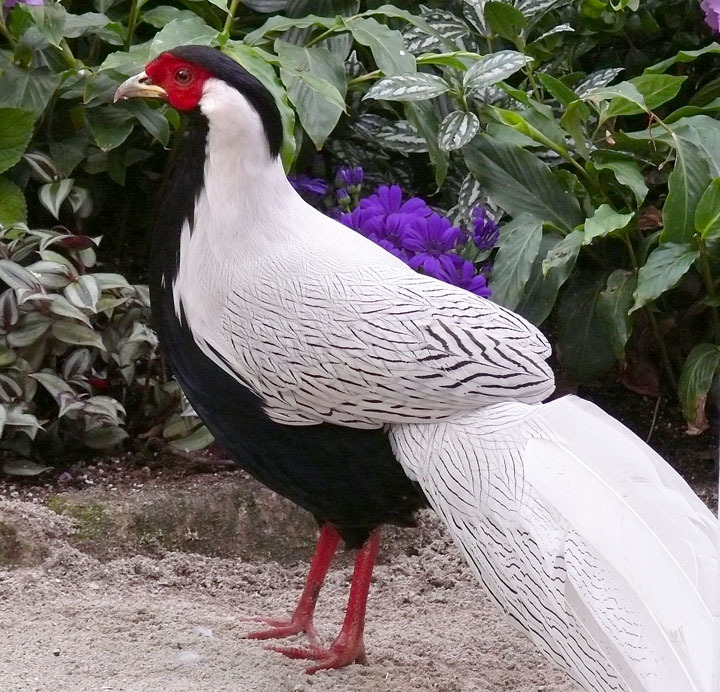 Silver Pheasants are considered common in mountainous areas of Southeast China and have been successfully introduced into Hawaii and Puerto Rico. Some references say this Pheasant is well known in ancient Chinese art and poetry and was sometimes referred to as the White Phoenix. If you did not find the birds you were looking for on this post, please take a look at A Quick Guide to the Birds of Bloedel. All of our feathered friends are a great reason to head to the Conservatory for a visit. They would love to meet you! What’s new at the dome? Wait until you see the new Carnivorous Garden, found on either end of the swinging bridge. These plants will intrigue you! New exotic Sundews: the Giant Elkhorn and the Cape Sundew from Africa, have their own techniques for feeding time! 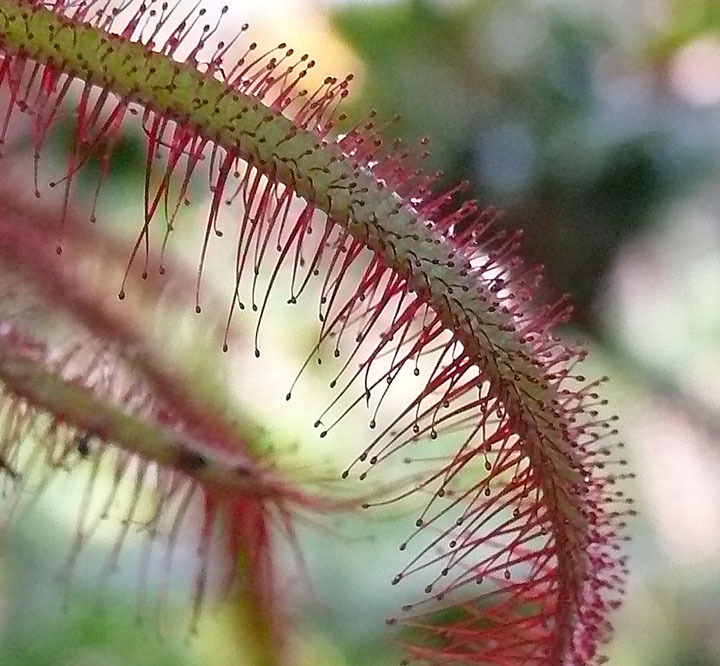 The Sundew’s leaves are covered with red tentacles that exude sticky drops of mucilage. Sundews got their name because these drops glisten in the sun like dew! The sticky adhesive acts like flypaper that binds unsuspecting insects if they make the mistake of landing. This mucilage is also a digestive enzyme. When an inattentive insect lands, the leaf will slowly curl around the bug and digest it for dinner! 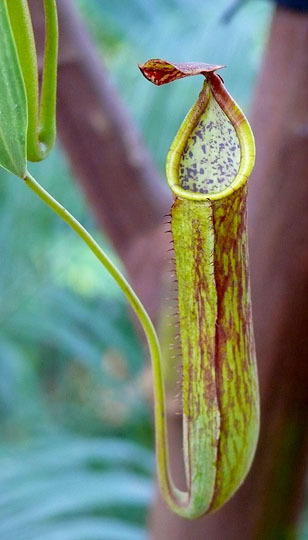 There are also different types of unusual Pitcher Plants. These pitfall traps lure insects with the sweet smell of nectar. Little do the bugs know, there are folded leaves deep inside the pitcher, which is filled with a pool of digestive enzymes. The top of the trap has a “lid”. This remains closed while the pitcher is maturing. As soon as the lid opens, the trap is ready! The smooth lip around the opening and the interior of the cup is waxy, so when an insect falls in, the wax flakes off and it can’t get back out! While you’re on the bridge, be sure to gaze into the koi pond and find the new butterfly, kinginrin and ogon koi. 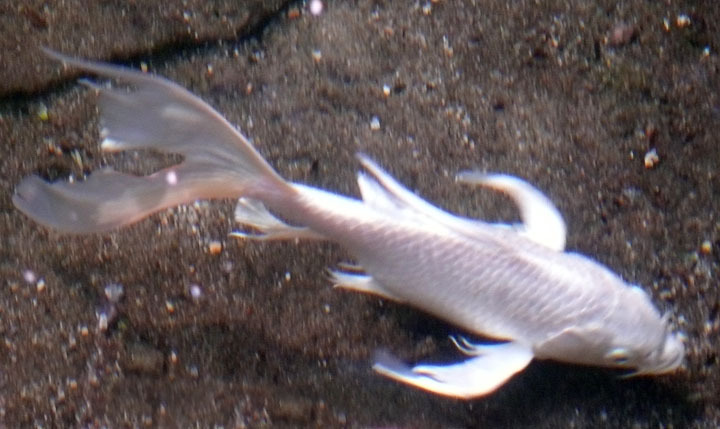 “Angel”, the all white butterfly koi has long flowing fins and tail while the kinginrin is pearly lemon gold. The new ogon variety is fairly easy to spot with it’s silver metallic scales. If you still haven’t seen the rare and beautiful orchids, fear not! There’s still time! 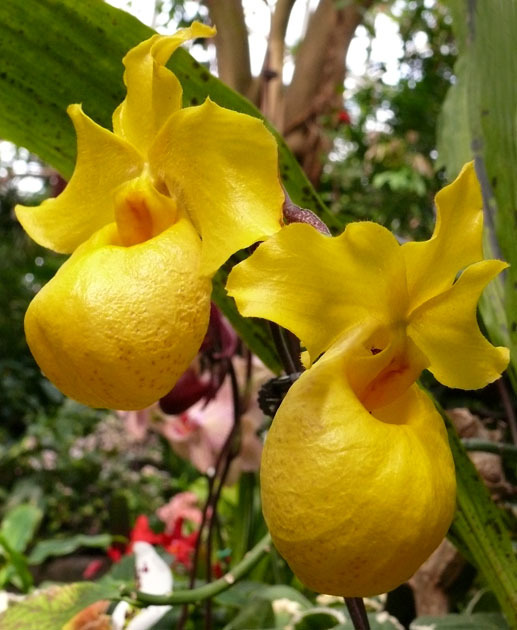 The Vancouver Orchid Society Show is on through Mother’s Day, May 8. What a perfect place for the family to take Mom! Plus, the Conservatory is now open Summer Hours to give everyone more time to enjoy the show. And before you go, take some time at the small bird feeding station. You might be lucky and spot the 2 new Cordon Bleu finches. These little fellows, native to Africa, are the newest addition to the Conservatory. 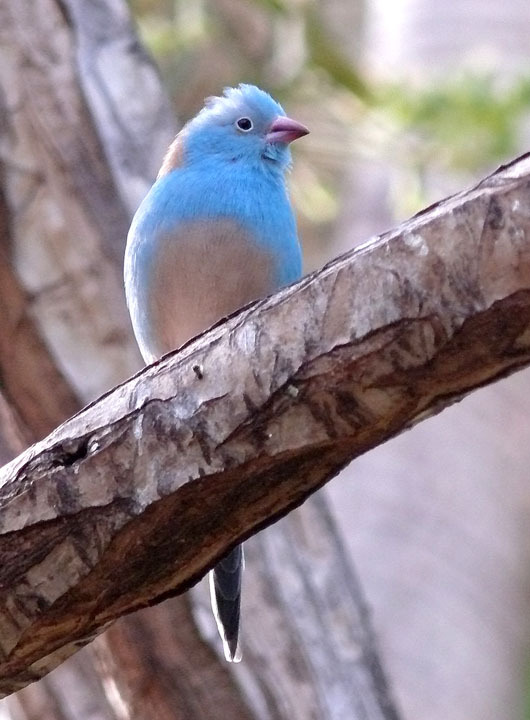 Their sky blue colouring and red beaks give them unique look and their songs are sure to make Mom’s day!